I love this prop. At least I think I do. Actually, I find it kind of unsettling, (I mean look at the picture below), but that might only be because the doll that Old Man Bakke over at HalloweenForum chose to use is the creepiest doll every produced. 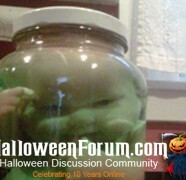 I mean, in his defense, if there was ever a doll that needed to go into a jar it’s the one he used…look at those eyes. Anyway, this is a simple prop that adds a lot of creep factor to any scene that you put it in. 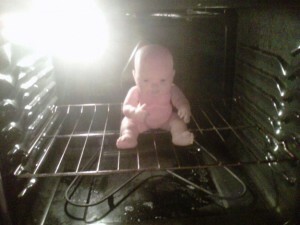 I’d be a little worried about putting it right on my oven rack, but as long as you monitor the heating you should be good to go.